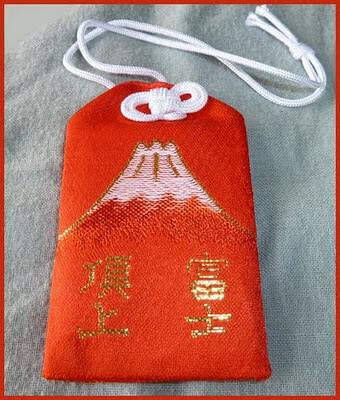 sold at Buddhist temples and Shinto shrine all over Japan. has produced many small items to protect from illness, bring good luck and money and wish for general happiness for the family. Introducing regional monsterlins, ghosts and demons and how people coped with them. Introducing miniatures of figures from festivals and rituals and much more ! . . - - - - ABC - INDEX - - - - . .
. General Information . Essays . 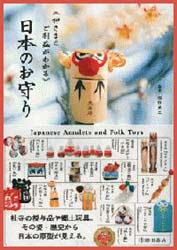 How to make a wish come true . . .
. minzokugaku 民俗学 /　民族学　folklore studies, ethnology . This is where you feel at home, where the ancestors are close by, where everything is all right. It is an emotion deep inside the Japanese soul.
. Furusato ふるさと,　故郷、古里 .
. Kami to Hotoke - the Deities of Japan .
. Reference, Books . . . .
. Daruma Museum Japan . They are used for many purposes. In Edo, many worked in the Kyobashi　京橋　district and also in Okemachi. Buckets of all sizes were used for many activities in the lives of the Edo people. Most buckets were made from wood, with a more or less deep bottom. keeping cooked rice (komebitsu 米櫃 rice stocker). to use wooden buckets and barrels to hold liquids. The boards of buckets and barrels are held together with cylindrical hoops, and when the hoops got old and broke or bent, a specialist artisan would repair them by binding them with new pieces of bamboo. These too could be efficiently repaired on the spot if one called a traveling artisan who carried materials and tools with him. here were special merchants who bought those old barrels, and there were specialty barrel wholesaler stores. There were even empty barrel wholesalers on the main streets in Nihonbashi, showing that it must have been a big business. 風が吹けば桶屋が儲かる If the wind blows, the Okeya makes good money . . .
①大風で土ぼこりが立つ If strong wind blows, there will be a lot of dust. ②土ぼこりが目に入って、盲人が増える If dust comes into the eyes, people will get blind,. ③盲人は三味線を買う（当時の盲人が就ける職に由来）Blind people buy Shamisen string instruments to make a living. ④三味線に使う猫皮が必要になり、ネコが殺される To make Shamisen, the skin of cats is used. ⑤ネコが減ればネズミが増える If there are fewer cats, there are more mice. ⑥ネズミは桶を囓る Mice will gnaw at the OKE barrels. ⑦桶の需要が増え桶屋が儲か Therefore the Okeya will have more work to do. Well, he also made kanoke　棺桶 coffins. And if the wind blows, there will be a fire somewhere and then . . . So he also made suitable buckets to carry water from the waterway. 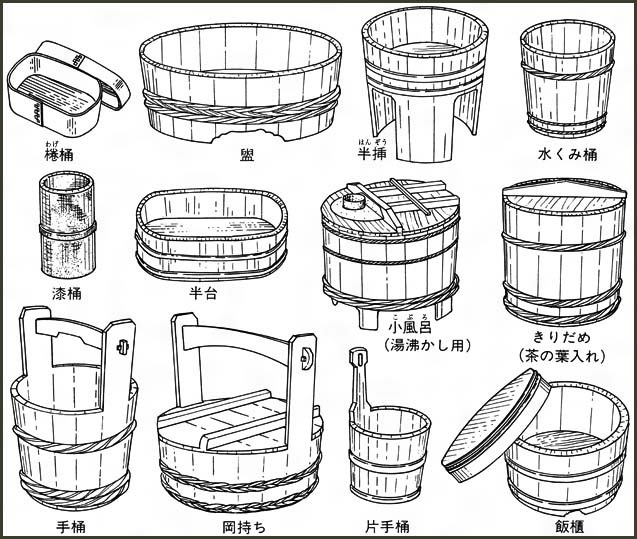 Others specialized in buckets and barrels for bathing or keeping Sake. According to its use, the thickness and type of the wood varied considerable. And buckets for liquids had to be especially tight. The wood was fastened with stripes of bamboo. 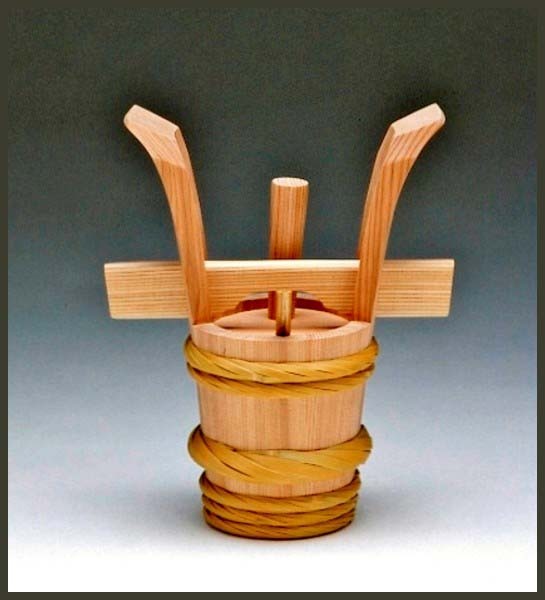 Shuji Nakagawa is a Japanese traditional craftsman of woodworks and a contemporary artist. He creates his works using a various woodwork techniques especially Japanese traditional wooden pail technique.
. My entries with OKE .
. shokunin 職人 craftsman, craftsmen, artisan . Barrels were used to keep all kinds of liquids. The most important was Sake 酒 rice wine. Some homes had their own barrel for sake, 家樽. Some of these had no special owner or lost him, and were collected by a specialist, who brought them to the wholesaler of empty barrels, 空き樽専門問屋. Many of these wholesalers had their home at 日本橋の大通り Nihonbashi, so it seems it was a lucrative business. This is one of the recycle businesses of Edo.
. My entries with taru 樽 . ... people usually used wooden tubs and barrels to store liquids. Wooden tubs and barrels were made of wooden slats fastened by bamboo hoops. 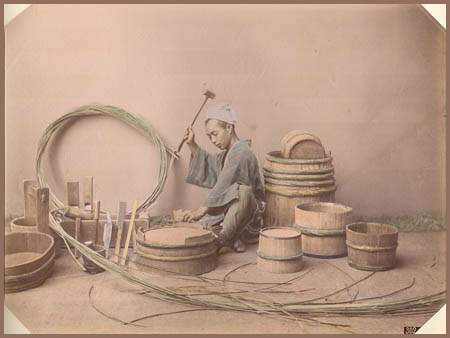 When the hoops aged and broke or warped, the craftsmen fixed the tubs and barrels with new bamboo fasteners. 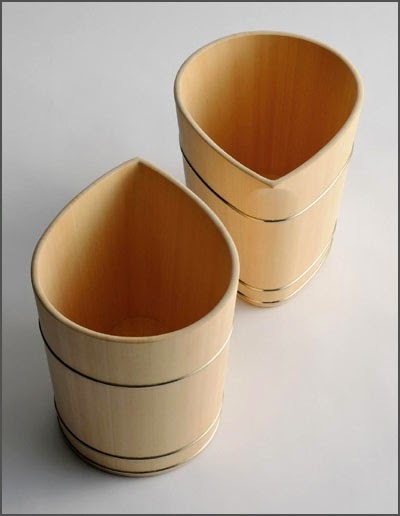 ... the barrels used to store products of fermentation such as sake, soy sauce and miso were invariably made from cross-grained slats to prevent leaks, while tubs, such as those used for sushi (vinegared rice), were normally made of straight-grained slats to help absorb excess water. Both barrels and tubs are made in the same way, with a round base being slotted into a cylindrical arrangement of slats which is then held together tightly by hoops to prevent leakage of the contents. The hoops used traditionally in Japan were made of woven bamboo strips, and so tended to stretch and loosen in time due to the constant strain and moisture to which they were exposed. These days, barrels with loose hoops would just be thrown out, but in the past there were specialized artisans (effectively a subset of coopers) who made a living from replacing old barrel hoops with new ones. 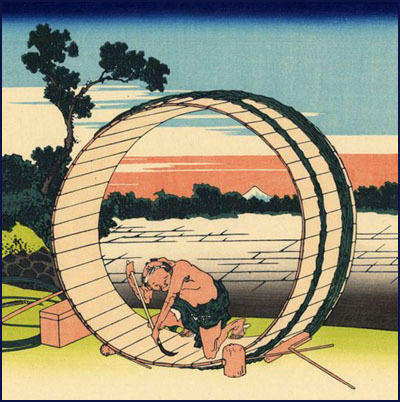 In the Edo period, there were merchants who specialized in the buying and selling of the masses of barrels circulating. In fact this was a major business at that time, and since the merchants would have bought barrels in various conditions of disrepair, I imagine that they would have employed fulltime coopers to carry out all the necessary refurbishing. According to a historian' s survey, the sake barrels being shipped from the Osaka and Kyoto area were all of a certain size that was much larger than the size used in Edo, and so it seems likely that Edo barrel merchants also used coopers to dismantle such large barrels and turn them into the smaller size used in Edo.
. okechoo, okemachi、桶町 Okecho, "Bucket district" in Edo . Many bucket makers lived in this area. A cooper is a person trained to make wooden casks, barrels, vats, buckets, tubs, troughs and other staved containers from timber that was usually heated or steamed to make it pliable. Journeymen coopers also traditionally made wooden implements, such as rakes and wooden-bladed shovels. In addition to wood, other materials, such as iron, were used in the manufacturing process. Elements of tubs dating from the 15th and 16th centuries have been discovered at the former site of Akita castle. Records dating from the beginning of the 17th century kept by one of the old families of the Akita clan, make it clear that tubs were being used at a sake maker within the present-day district of Ogatsu-cho. There are also 19th century examples of different types of barrels and tubs preserved by the Aoyagi family of another district, Kakunodate-cho. They have a coating of lacquer and both copper and bamboo bands were used, and the shapes are the ones which are followed today. The wood from natural stands of local cedar has a fine straight grain and besides having a wonderful scent, it is not prone to distortion as the wood moves so little. The superb quality of the wood contributes to the warmth of this craft and brings both charm and a sense of quality to the lives of those that use these tubs and barrels. 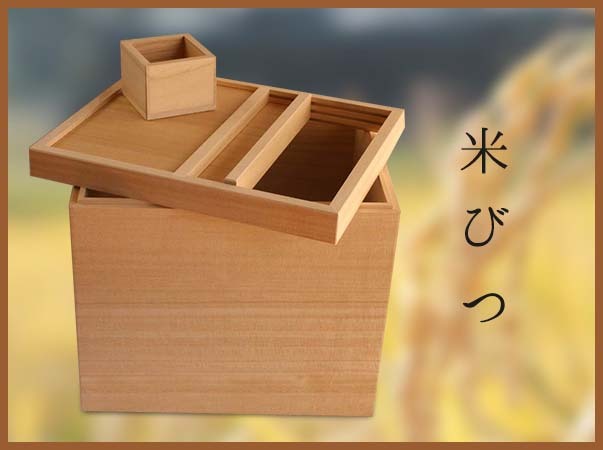 The scent of the wood is especially contributive to the value of such items as Japanese bath tubs, tubs for sushi, beer tankards, sake flasks, and rice tubs. Flower vases, too, benefit from the wood in a different way, as do candy tubs and umbrella stands.
. . . CLICK here for Photos 桶屋 !
. Yamanba, Yamauba 山姥 old mountain hag . Once upon a time, a bucket maker went to the mountains to cut bamboo and then made a fire, when an old mountain hag appeared. She could read all the thoughts of the bucket maker but he just kept roasting the bamboo when a spark flew over to her. So she cried and said she can not trust humans any more and never came by. The wicked Tanuki Hachibei from the Temple Kennin-Ji often took just one geta 下駄 wooden sandal from a visitor. He often ordered a lot of food from the local Sobaya 蕎麦屋 Buckwheat shop. Around 1897, the owner of the bucket maker shop caught the Tanuki and threw him into the river 加茂川 Kamogawa.
. tanuki 狸 - mujina 狢 － racoon dog, badger legends . 生あるものなら家に来い - If you are a living being, come to my home. Thus the bull disappeared, but the bucket maker felt a great chill. In this area, a Tanuki often poses as something else.
. Legends about the Red Cow, Red Bull 赤牛と伝説 aka-ushi, akaushi . Once upon a time, a bucket maker said he wanted a wife who does not eat rice. A man came with his daughter and the bucket maker got her as wife. But she was a monster with a mouth at the back of her head, so the bucket maker chased her away. 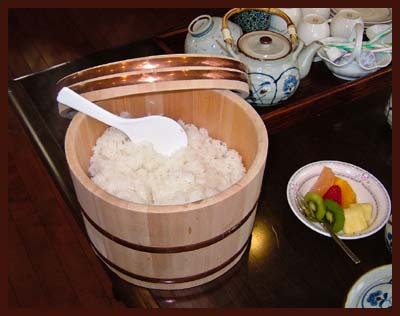 He made a large bucket and put some hyootan 瓢箪 gourds and rice grains inside, which he had put on needles. The wife, which was actually hebi 蛇 a serpent, came with her children and ate the grains, but they got stuck with the needles and died. Once along the beach in the South, a rice stocker and some money was floating along but nobody came to pick it up. The local people say this comes from shipwrecked boats and if someone picks it up, he will be cursed. a bucket maker named Kiheiji had been keeping a cat. But one day she did a creepy cat dance with a lantern, Kiheiji thought she must be a monster and chased her away. The cat was picked up by the restaurant 和泉屋 Izumiya and there she begun to wink to people passing the highway. This soon became popular and the restaurant became quite rich. The cat was called 福猫 Fukuneko and when she died, a mound was erected in her honor. The Okeya was called 喜平次 Kiheiji.
. kudagitsune クダ狐 / 管狐 "Pipe-Fox" helper . The Yamachichi is so big it can fly from mountain to mountain. On a foggy morning, when the bucket maker was busy working, a Yamachichi appeared, it had only one eye and one leg. The Yamachichi could read the secret thoughts of the bucket maker and he became quite afraid. He kept working and a splinter of bamboo hit the case of Yamachichi. "You are doing quite strange things!" and the Yamachichi run away never to come back. - similar to the legend from Iwate above. with a thread of silk spun from the textured floss of leftover silk cocoons.
. orimono 織物 weaving . is a silk fabric woven from the floss remaining in the silkworm cocoon after the full threads have been removed. By spinning these broken strands together silkworm farmers created a fabric for for their own use. Today tsumugi is highly prized and one of the most expensive kimono fabrics despite its humble origins. Tsumugi was originally spun, woven, and sewn into a kimono by one person for the use of her household, so there are many distinct regional variations. However, all tsumugi can be readily identified by its characteristic slubs and sheen. The slubs (rough lines in the weaving) are created by spinning the silk. Initially tsumugi fabric is very stiff, due to the starch applied during spinning, but the more times it is worn and washed, the softer it becomes. Very old tsumugi is as soft as silk fabric woven from untwisted threads. Broken threads left inside the silk cocoon are collected by the farmer. These are degummed in a hot water bath with sodium bicarbonate (baking soda) and sulfurous acid (a mild bleach). After rinsing, they are hung to dry out of direct sunlight. After drying, the silk floss is placed in a bath of ground sesame seeds and water. The oil from the sesame seeds makes it easier to draw individual threads to be spun. The spinner uses saliva to adhere the new threads to the old ones. This produces the characteristic sheen and stiffness of tsumugi. After spinning, the thread is dyed and then woven into tsumugi. 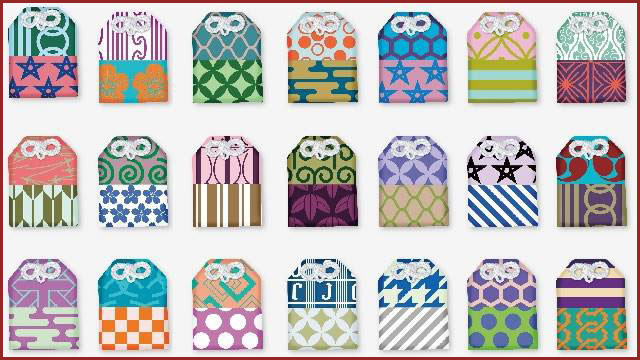 The most popular patterns include shima, ichimatsu, and kasuri. After weaving, the fabric is steamed to set the dyes and then made into kimono. in Yuki City, Ibaraki Prefecture. 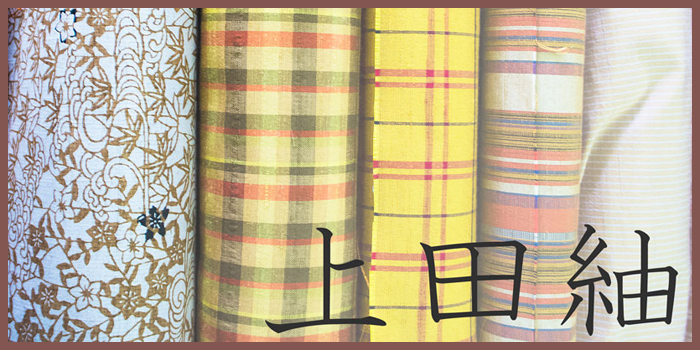 The best "Tsumugi" fabrics used for clothing, designated as an "Important Intangible Cultural Property. "The silk fabric which is hand spun from the floss is dyed manually so that splash patterns will come out on the fabric after it is woven. They are hand woven in "Jibata"(a loom with no legs) and the designs are small crosses of splash patterns. Warm, light, tough and free from wrinkles, the fabric does not fade or discolor easily, but increases its luster the more frequently it is washed and stretched. This fabric is of such good quality that it is said that "Yuki Tsumugi" should first be worn as a night wear and then used as a going out wear. It takes 10 to 15 days to weave a plain fabric and 30 to 45 days to weave a small patterned fabric for a piece of cloth required for an adult garment (36 cm width and 840 cm length). The pongee was well known as "Hitachi Ashiginu" ( a fabric woven with thick and rough silk threads) in the Heian Period and as "Hitachi Tsumugi" in the Kamakura Period. In 1602 the name was changed to "Yuki Tsumugi" as it became an item for presenting to the Shogun. 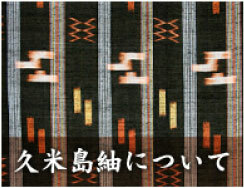 After that, weavers from Ueda (Nagano Prefecture) were invited, resulting in an improvement of the quality with the technique used in weaving stripes. The production was a side job for farmers in the middle of the Edo Period. At first, only the plain and striped fabrics were produced, but the striped "Kasuri" was invented in 1866, the splash patterns made of both warp and weft in 1873 and crepe pongee in the early Taisho Period. The fabric was well known in the old days and quoted in a poem in "Manyoshu"(Ten Thousand Leaves), an anthology of 4,516 poems, compiled in late Nara or early Heian Period, around 800. New cocoons of Mt. Tsukuba. Worn by my loved one. Silk fabrics: white pongee and striped pongee, handwoven with home spun threads. Because it is so tough, it can pull out a nail when hooked, the fabric is also called "Kugi Nuki Tsumugi"(nail pulling pongee). Clothing, coats, sashes, neckties, pouches, etc. This district started producing silk from olden days because of flourishing sericulture and hand spinning techniques. It is said that the origin of the fabric was in the years after the "Heiji Revolt "(civil war) in 1159. First woven as side jobs for farmers, it was marketable as "Ushikubi Tsumugi" and "Hakusan Tsumugi" in the Genroku Era (1688-1704). It was industrialized in the late Meiji Period and flourished in the late Taisho Peiod. Since the Showa Period, however, production died out and only 2 factories are producing it today. Mostly made in 奄美大島 Amami Oshima Island. 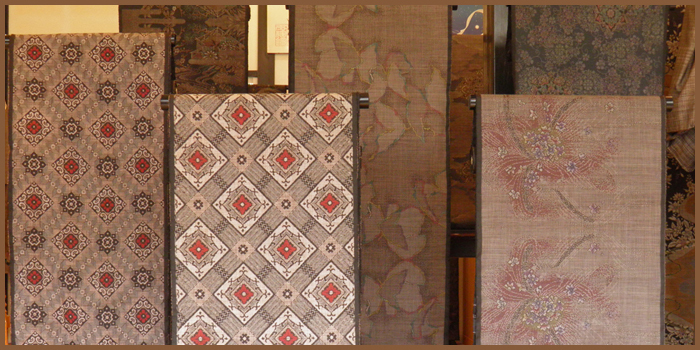 The origins of Shinshu Tsumugi go back to a silk cloth called あしぎぬ ashiginu that was woven in the Nara period (710-794). Because of the rivalry and encouragement that the clans in the province of Shinshu were given, sericulture was very popular and the production of pongee throughout the province flourished, and every year large quantities of cloth were dispatched to Kyoto. The production of this cloth then fell into gradual decline by the 1920s, only enough was being made to keep the skills associated with this cloths alive. 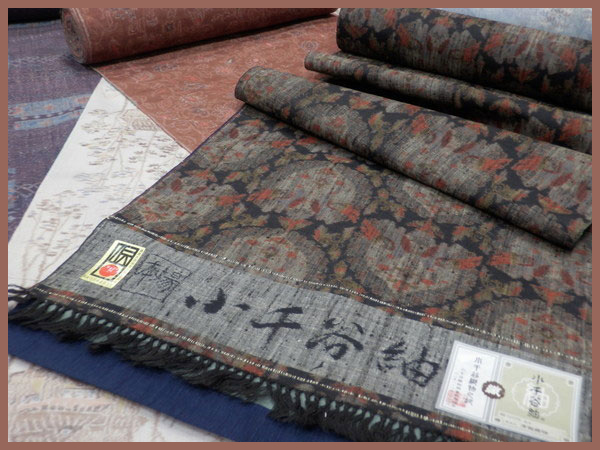 After World War II, great efforts were made to revive the fortunes of this cloth not only by the prefectural authorities but by local authorities and communities, and production once again flourished throughout the region. The making of cloth for top quality kimono followed and served to raise people's awareness of this fine cloth. Most of the cloth produced in various colors and patters is for kimono or obi. One extremely special cloth is woven from a silk obtained exclusively from wild silk worms. 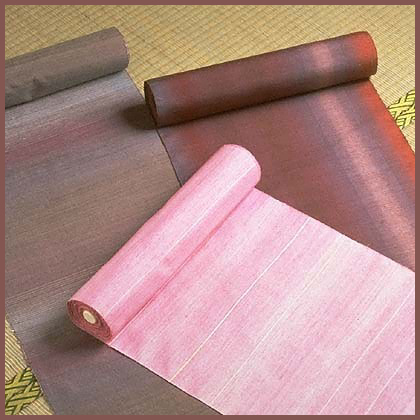 Ueda Tsumugi is a traditional woven silk fabric popular since Edo times. At studio workshops in Ueda, craftsmen continue the tradition today. There you can see some of the kimonos, mufflers, purses and other articles made from Ueda Tsumugi, as well as see some being made. And for those who want to try weaving an item themselves, you can try your hand at a weaving loom to make your own original Ueda Tsumugi souvenir. Pongee was first produced here in the middle of the Edo period (1600-1868), when sericulture began. By the end of the same era, production had increased to such an extent that silk merchants came to do business from places which had their own flourishing weaving industry such as Kyoto and Joshu, the area that now corresponds to present-day Gunma prefecture. Ojiya Chijimi techniques were used to produce a pongee suitable for home use woven from silk yarn reeled from leftover cocoons. The existence of this pongee was overshadowed by Ojiya Chijimi but production of a pongee actually started in earnest at the beginning of Showa (1926-1989). The basis for today's pongee was perfected after a number of improvements were made to the pongee yarn. Because the yarn used for this pongee cloth is reeled from cocoons, the threads have an interesting unevenness and make a light warm cloth. Various folk-craft designs are used and kimono of this colorful cloth provide plenty of opportunity for elegant dressing. The cloth is now also being used for interior items. The history of weaving in the Shiozawa area is very long and an example of a linen cloth --now Echigo jofu 越後上布 Echigo linen-- woven during the Nara period (710-794) is preserved in the Shosoin Repository in Nara. 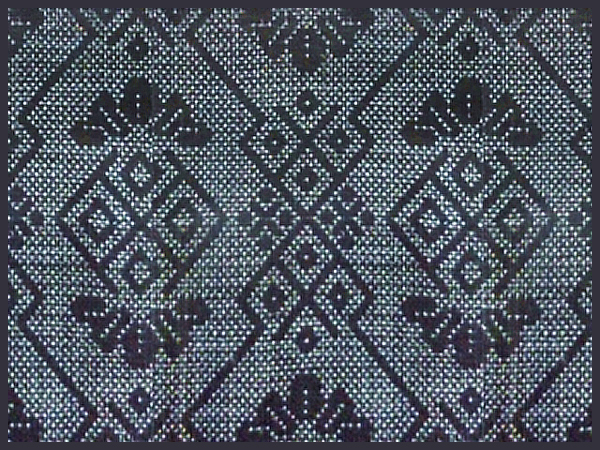 The skills and techniques used to weave this linen cloth were adopted for the weaving of a silk cloth that became Shiozawa Tsumugi and was first woven during the Edo period (1600-1868). 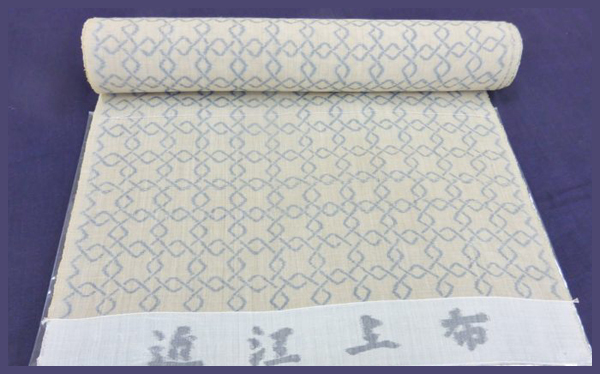 This cloth is characterized by a very particular sense of quality and refinement derived from its ikat patterns which are composed of fine crosses called kagasuri 蚊絣 --"mosquito ikat"--and a kikkogasuri 亀甲絣 of box-like pattern, both achieved by tying bundles of thread and rubbing in the dyestuff before weaving. The cloth is used exclusively for kimono.
. Kumejima tsumugi 久米島紬 Kumejima pongee . 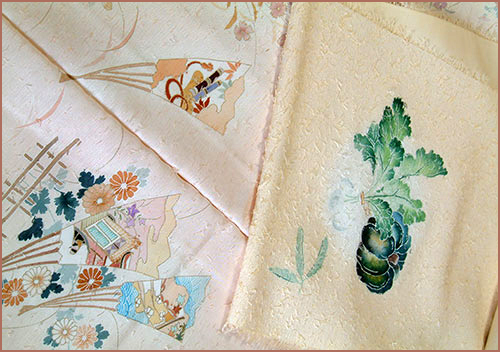 Silk has been used since the mid-Edo period. The strings were used for fishing nets. When the nets broke, they strings were used for weaving cloth. The material has a delicate, but rough touch. made from left-over silk yarn. 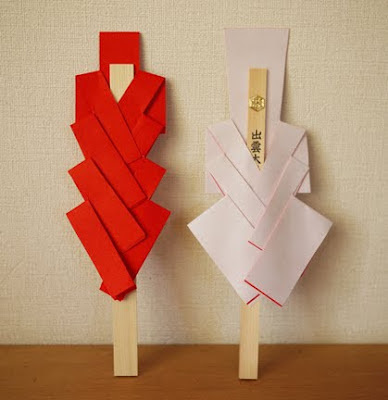 A traditional craft of Hikone. While dating back to the 8th century, the weaving of this cloth did not become firmly established in this area of Yamagata Prefecture until the beginning of the 17th century. This was when 上杉景勝 Uesugi Keisho Kagekatsu, the lord of the fief, encouraged its weaving. There are a number of individual cloths being produced. There is the traditionally woven 白鷹板締小絣 shirataka itajime kogasuri, an unassuming ikat cloth and another small motif ikat called 米琉板締小絣 yoneryu itajime kogasuri; and a weft ikat and another with ikat threads in both the warp and weft. Safflower is just one of the natural dyes used for a pongee cloth using these dyestuffs. Inevitably, it is the handmade look of these cloths which is now attracting much attention among consumers. yoneryu itajime kogasuri, shirataka itajime kogasuri, yokosogasuri, heiyougasuri, kusakizome tsumugi, and benibana tsumugi. All are yarn dyed and plain woven.
. Reference - tsumugi pongee.
. ukai 鵜飼 (うかい) cormorant fishing . 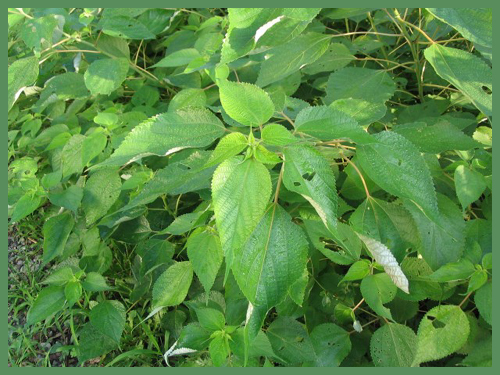 Ramie is a flowering plant in the nettle family Urticaceae, native to eastern Asia. karamushi is one of the nettles called a false nettle.
. kasuri 絣 Ikat patterns . 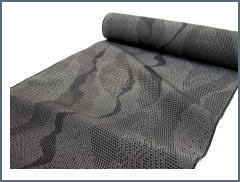 Jofu is a premium woven ramie fabric (“Ramie” is a natural fibre that is similar to hemp and linen. 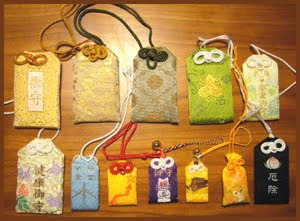 It is a strong fibre that has been used for Kimono since ancient times). It is said that the origin of Notojofu goes back to about 2,000 years ago, when the daughter of Emperor Sujin was in the Noto region (area in the Noto Peninsula, middle part of Ishikawa Prefecture, Japan), where she created a thread using wild ramie and taught weaving. the technology was introduced from other regions of Japan. 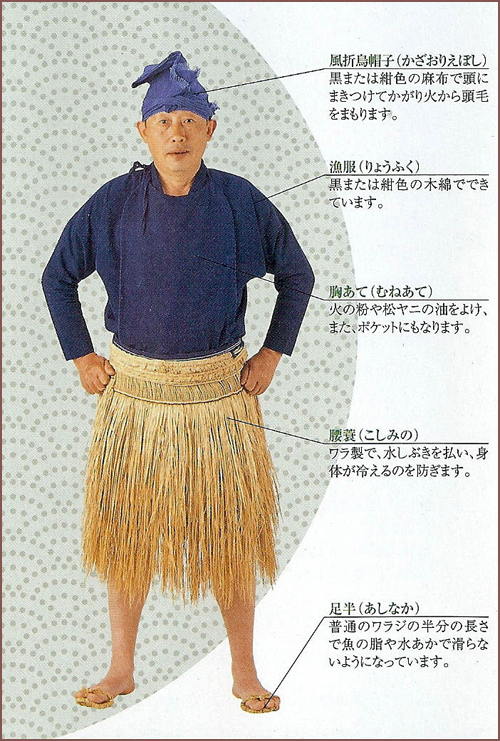 Then, in the early Showa era (around 1930), the fabric was hailed as the best ramie fabric in Japan, and in 1960, it was designated as an intangible cultural asset for Ishikawa Prefecture. Women of farmer’s house almost wove in the winter, during the agricultural off-season. which serve as the representation of the manufacturing of elaborate Tate- Yoko Kasuri (the splashed pattern created by dyeing the warp and weft threads separately beforehand based on the pattern and finely adjusting the weft threads to match the pattern; warp and weft resist-dyeing) using Notojofu’s unique dyeing techniques, such as Kushioshi Nassen (comb-press dyeing) and rolling Nassen, have been identified as an Intangible Cultural Heritage of Ishikawa prefecture. 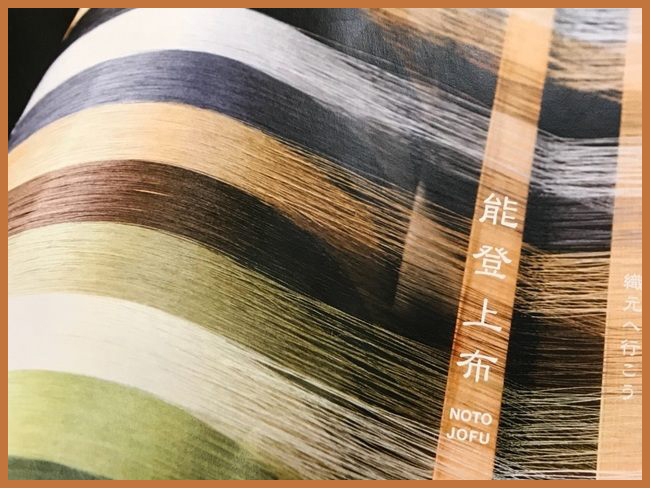 Notojofu is woven by hand in the traditional manner, and is distinctive for its rustic coloring and high-quality patterns, known as “Kasuri.” Its delicate texture is described as similar to a cicada’s wings. Also, Its characteristics are ramie’s crispness along with durability. 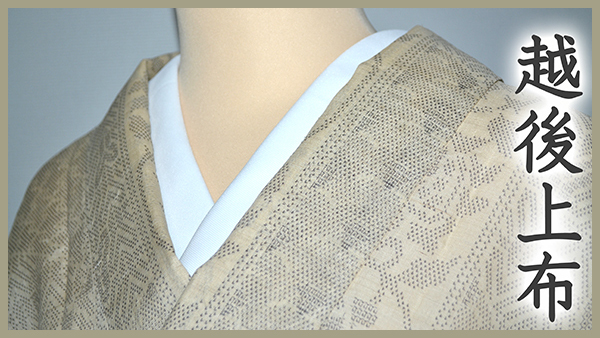 Soft and cool, it is often used as a fabric for “Kimonos” to be worn in the hot summer. Anyone who wears a Notojofu Kimono even once is sure to agree. The rustic colors that fit Noto’s climate and traditional splashed patterns contain refinement and beauty that stand the test of time. 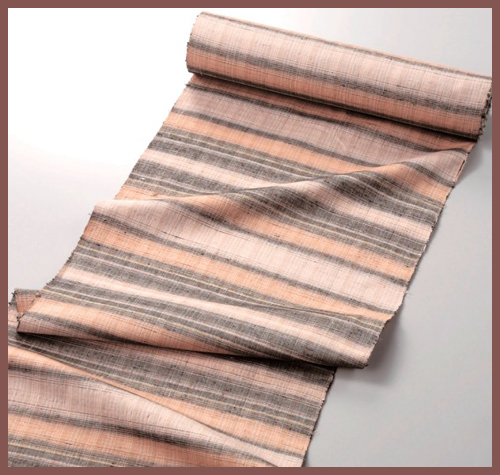 Nara Sarashi 奈良晒 "Nara Bleached Fabric"
the origin of Nara Sarashi goes back to the age of Kojiki. 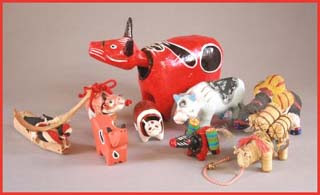 An intangible cultural property of Nara since 1979. Developed in the tradition of Echigo Jofu. Made from specially selected karamushi 苧麻 Boehmeria nipononivea and Iwashima asa 岩島麻 hemp from Gunma. Until the 13th century often used for robes of priests. 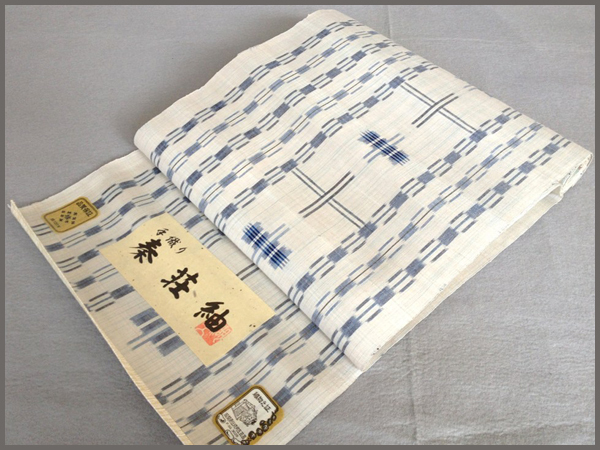 a fabric of Echigo, Japan on national Important Cultural Properties listing in 1955, and UNESCO's Intangible Cultural Heritage of Humanity list since 2009. It is made from fine bast fiber from the ramie plant (Boehmeria nivea), also called hemp, although not directly related to cannabis hemp. 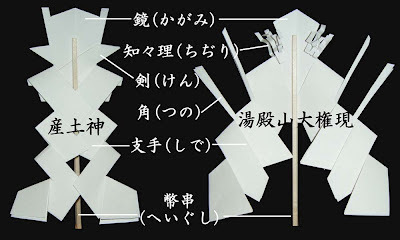 [a] After it is woven on a jibata backstrap loom (地機), the fabric is spread on snowfields (yuki-zarashi) where ultraviolet light from the sun creates ozone and bleaches it white. The fabric is used to make summer kimonos and other traditional garments, cushions and bed linens. 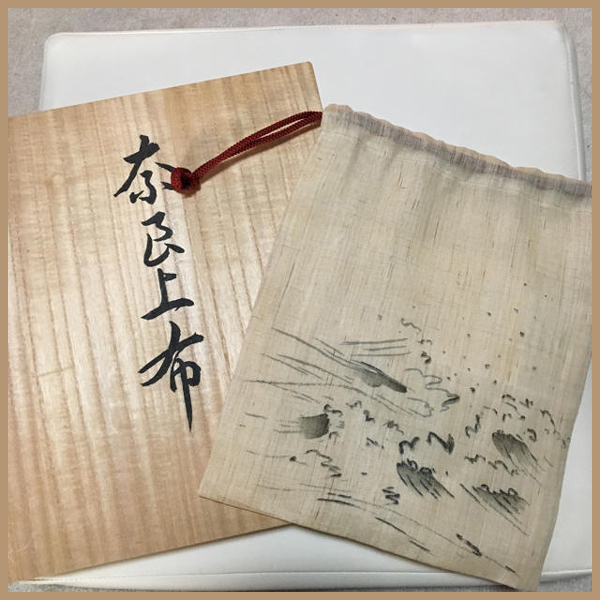 Fostered by the well-known entrepreneurial spirit of Omi tradesmen, the hot local climate and a plentiful supply of water from the Aichi River, production of woven ramie cloth developed in this area from the Kamakura period (1185-1333). The craft flourished during the Edo period (1600-1868) with encouragement from the Hikone clan, which ruled the area around Hikone on the southern shores of Lake Biwa, and it became a well established local industry as a result. From that time on, great improvements were made in dyeing techniques giving rise to the superb ikat patterns characteristic of Omi Jofu. is either in the weft alone or in both the warp and weft. 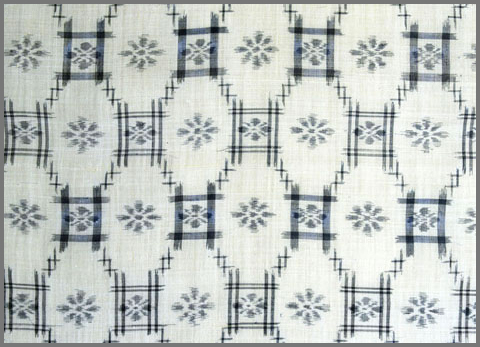 Weft threads are mainly bound before being dyed using a stencil for the weft ikat cloths. 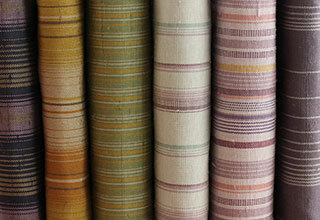 In the case of the warp and weft ikats, both sets of threads are dyed by applying the dyestuff to the bound threads. The positions of the warp and weft threads are then adjusted as the cloth is woven to produce what is one of the craft's top cloths. Ramie is a very comfortable cloth to wear as it is cool and absorbs moisture. These days, cloth is usually made for traditional garments but is also used for coats.
. . . CLICK here for Photos - 上布 !
. WKD : joofu 上布 Jofu cloth .